This season has just begun and when you look at the latest fashion trend that has taken the world by storm, the first thing that immediately comes to our mind is the trendy short hairstyles for women. Just like all fashion trends that keep coming back and forth, the short hairstyles that were a craze few years back, are getting popular from last year itself. With the New Year and the spring season arriving, short haircuts for women have started trending with several celebrities sporting them on different occasions. The following article has a good list of some of the trendiest and coolest looking short hairstyles for women. Choose a hairstyle that suits your face and lifestyle. These trendiest hairstyles will put you at a centre stage and you are sure to get some very positive complements. This is a medium-short haircut that gives a younger look. The long pixie cut is the most popular haircut that is trending right now. It has a short back and sides allowing the top length for adding texture or creates wavy sections that you can wear in different styles. If you have thick and natural wavy hair, then a wavy bob cut looks great. This is a short to medium length hairstyle for women. The chic bob frames her face with soft and flattering controlled waves. This short hairstyle for women is suitable for anyone with a natural and curly hair that can be pretty hard and coarse to brush. The sliced layer technique eliminates the unwanted bulk and leaves the hair manageable, stylish and easy to style bob cut. For fine and medium length hair, this short bob hairstyle is both suitable and youthful. This haircut includes lot of layers to create that extra volume and texture. The side swept fringe is fresh and cute looking. This is a very feminine haircut that softens the facial features and is ideal for women of all age groups. The hair is neatly styled behind the ears with just a few spiky tips making this contemporary blonde bob hairstyle look quite relaxed and cool. The layered razor cut looks nice on any face shape that has the ability to make you the centre of attraction. The Apricot highlights are a new trend that has garnered a lot of attention. These warm and pastel shades look classic and fantastic on this smooth hairstyle. The hair tips are left sharp that gives an overall fuller look. This vintage haircut looks and reminds you of the glamorous hairstyles celebrities like Merlyn Monroe wore. The multi-layered haircut has now become the contemporary classic hairstyle for women who would love to sport a short hairstyle. To add volume to the fine hair, few curls have been introduced to this hairstyle. A good blend of white gold and pale gold blonde shades seen in this hairstyle adds a lot of texture and depth, which is a good way to create an illusion of thick and voluminous hair. The Multi-layered cut is suitable for all age group people, hair color and face shape. This is a trendy, short curly hair style for African-American Women. Style icon Rihanna looks absolutely gorgeous in different short hairstyles. This is a closely trimmed short haircut for women with several pretty points in front of the ears with extra length at the top. The top is styled in soft waves that add height for the short hairstyles for women. This cute boy cut is suitable for any occasions. The side-swept vibe short hairstyle for women is ideal for ladies with medium or thick hair. The short haircut by Anne Hathaway here looks great with a platinum blonde shade that goes well with her face shape. It is an ideal cut for fine and straight hair as it doesn’t depend on volume to enhance the facial features. Brunette or blonde, both suits the facial features of Anne Hathaway. Platinum blonde is tipped as the top color in 2016. Create your own faux bob hairstyle by pinning-up the long hair in a curly or smooth horizontal roll at the back. The hairstyle here is styled smooth and formal or can be left messy to achieve a casual look. The smooth faux bob hairstyle is a nice way to create short hairstyles if you have long hair. The final look will be absolutely different and altogether new. A lot of singers are known to sport this close shave cut or buzz cut with a lot of style. Cutting your hair so short may not be a piece of cake for many women, but Jessie. 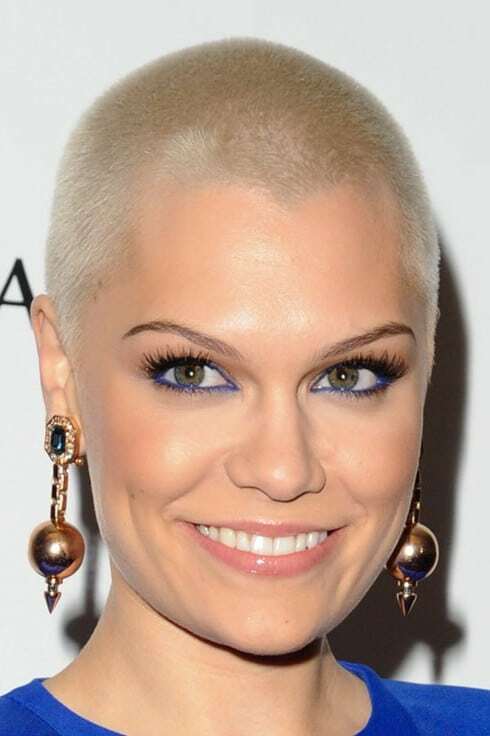 J here is seen sporting the blonde buzz cut and it suits her face. As she let her shaved hair grows back, Jessie. J has displayed some unique styles. Singers like Amber Rose have also sported this short hairstyle before. During the 60s this was a very popular hairstyle for the “mod” girls. They used to call this hairstyle the “hedgehog cut”, but who had known that the same haircut will take centre stage even in 2017. Way to go girls! The choppy bob is suitable for fine to medium texture hair. The hairstyle sported by Scarlett Johansson is rich in texture and movement and the beauty of the hair is accentuated by the dual highlighting scheme. The honey and caramel short haircut is a perfect example of an “edgy chic”. The haircut here showcases how a nice natural wavy hair can make your hairstyle easy to style and look trendy.